The official flag of Alaska was adopted in 1959 and features a blue field that represents the sky, sea, mountain lakes, and wildflowers of Alaska. The flag has eight gold stars including seven from the constellation Ursa Major and the eighth being the North Star, representing the northern most state. The flag was designed in 1926 by a 13-year-old Native American boy, Bennie Benson, from the village of Chignik. We at Tuff Flags offer beautifully crafted, high-quality, made in the USA, outdoor and indoor Alaska state flags that are well suited for mounting on most flag poles. Choose your size and mounting type and you are all set to create a spectacular flag presentation. Offered in various sizes like 4’x6’, 5’x8’ 6’x10’ and 8’ x12’, our flags are perfect to show your state pride. 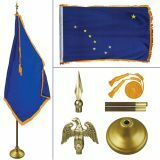 Shop from our complete line of Alaska State Flags right away and get the best prices, quick shipping, and much more! 100% customer satisfaction guaranteed! 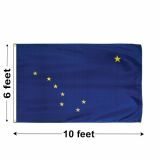 Our Alaska state flags are available in a variety of sizes, materials, and mounting options. Our nylon flags made of 200 Denier UV resistant fabric and Dupont colorfast inks will retain its beauty for a very long time. Light weight and durable, our flags will fly in light breeze and dry quickly after a storm. If you are looking for a heavy duty outdoor flag, our polyester flags are a perfect choice. We also have beautiful indoor flag kits complete with ornaments and tassels for you to set up an impressive flag display that will surely impress your audience. 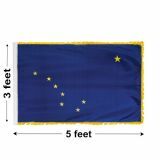 Whatever is your flag flying needs, we can find or custom make the perfect flag for your display.Browse our collection Alaska State Flags and choose a size that matches your need. Should you need any assistance, just call us at our toll free number (888) 287-3524 or email us at customercare@tuffflags.com.